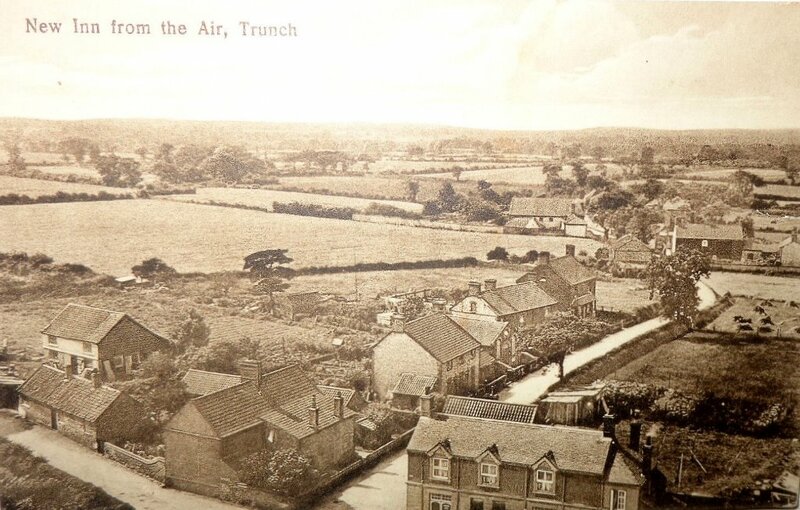 On this page you will find photographs and information about some of the old houses and cottages in Trunch. 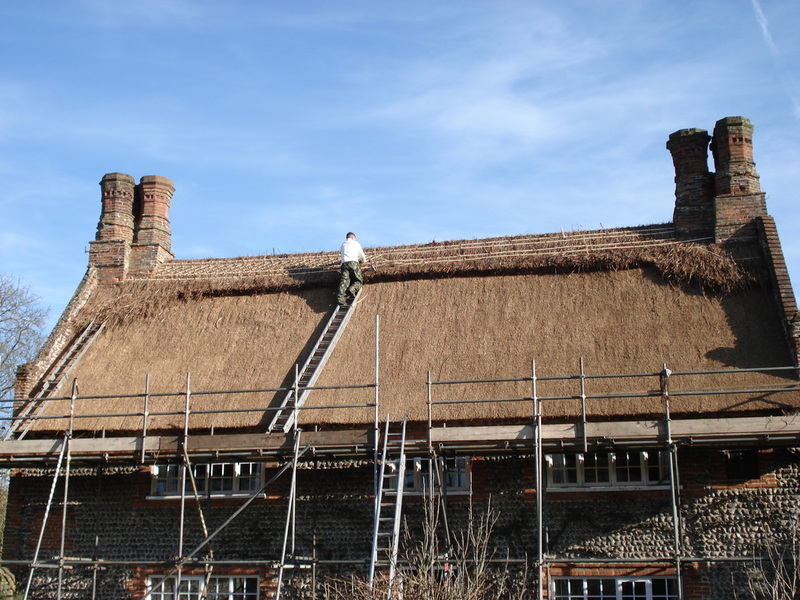 Farmhouses have already been described on the agricultural buildings page. Contents of this page - in this order:- Vine Cottage, Rose Cottage, The Limes, The Laurels, Trunch House, Osborne House, Tudor Cottage, Wright's Loke Cottage, Malthouse Cottages, Bloom's Turn Cottages, Corner Cottage and Cottages in Warren/Brewery Road, Chapel Road and the cottages around the church. VINE COTTAGE is a late 16th. Century, listed building on the Hill. 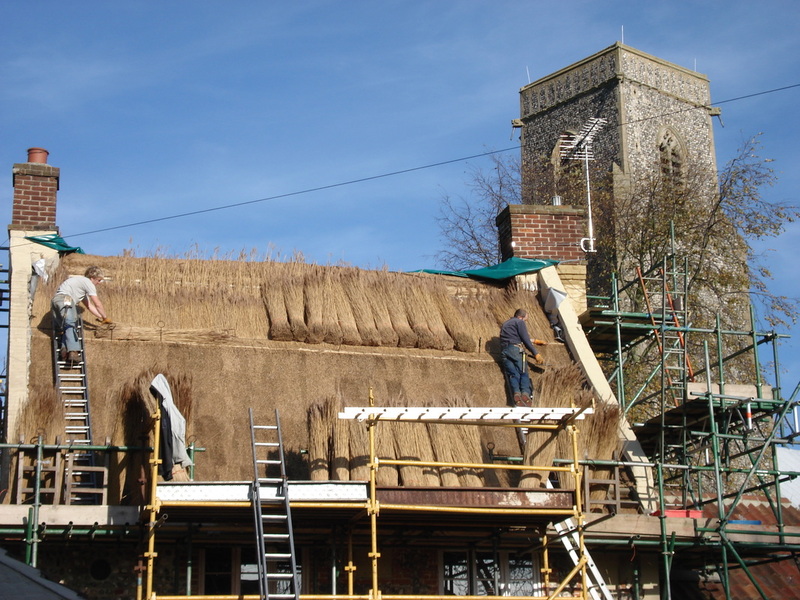 It is made of flint and brick and is thatched with unusual chimneys in groups of three. Some of the windows have been blocked up in earlier times. In 1839 it was owned by James Gay and John Cook was the tenant. It is not named in any of the early census returns but I think that Sarah Cooke lived there in 1841, she was said to be independent and the Larkes lived next door. By 1851 the Larkes were said to be living in Cookes Farm. in 1911 Stephen Bright, a farm labourer, was living here with his family and several relatives who were all farm labourers. It was said to have 6 rooms but I think it must have more and they were only using 6. Perhaps they were renting part of the house. In his book Arthur Amis says that he remembers Ralph and Albert Fuller, who were small farmers, living here at the beginning of the 20th. Century. In the 1940s the Bright family were photographed in front of the house so probably lived there. Miss May lived here until she died in 2016, when it was put up for sale. The house has now been bought (2017) and is being sympathetically restored. ROSE COTTAGE on Knapton Road is a late 18th. 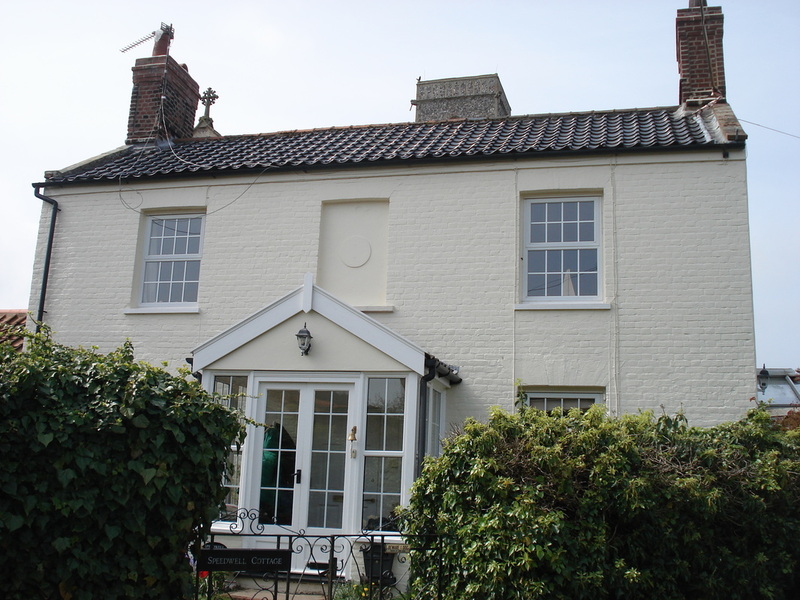 Century brick and pantiled, listed house with sash windows. At one time it was called "Roseabella". The 1839 Tithe Map indicates that the house was owned by James LeGood and that Ann Butcher and Thomas Cutting were living there. In 1891, Anna Dix "living by her own means" was there with one servant and in 1911 John Larke, a gardener, was there with his family. The house was said to have 7 rooms. THE LIMES is a fine 11 roomed house on Chapel Road. 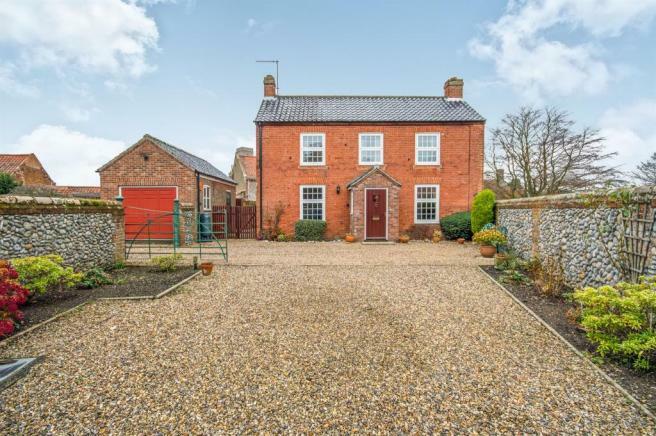 It is made of brick with black pantiles and sash windows. White's directory of 1883 lists Alfred Primrose, a farmer, as living here and in 1881 and 1891 he was here with his wife and family. In 1901 and 1911 it was the home of his widow and children. She was said to be "living on her own means". Earlier occupants may have been Deborah Wortley in 1841-1861 and Henry Withers in 1871. THE LAURELS on Chapel Road is a brick and tile house with double bay windows probably built in the 19th. Century. It is possible that M Bullen lived there in 1871, and T. Learner in 1881 and 1891. It is only named in the 1901 census when William Gibbons and family were living there. He was described as a farmer employing others. I think that the "Laurel Cottage" named in the 1841 and 1851 census was a smaller building in the Southrepps Road. and gardens with Benjamin Rust and William Ino as the owner-occupiers. John Greenhill, a spirit merchant lived here from 1861 until 1901. It was named as Trunch House in the 1911 census and Elizabeth Greenhill was living there on private means with her relatives. The house was said to have 11 rooms. 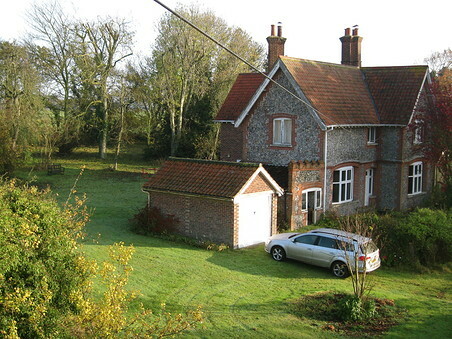 In 1978 Trunch House and 2.8 acres of land was sold by auction for £10,500 to W. Bird builders of North Walsham, with planning permission for housing development. 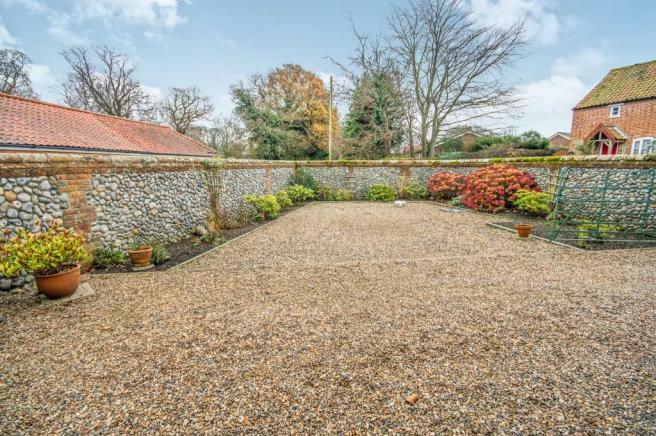 It was on the south side of Chapel Road where Kingsleigh Close is now and an old flint wall can still be seen. OSBORNE HOUSE This is the house of the nursery or market garden in Brewery Road, or Warren Road as it was once known. 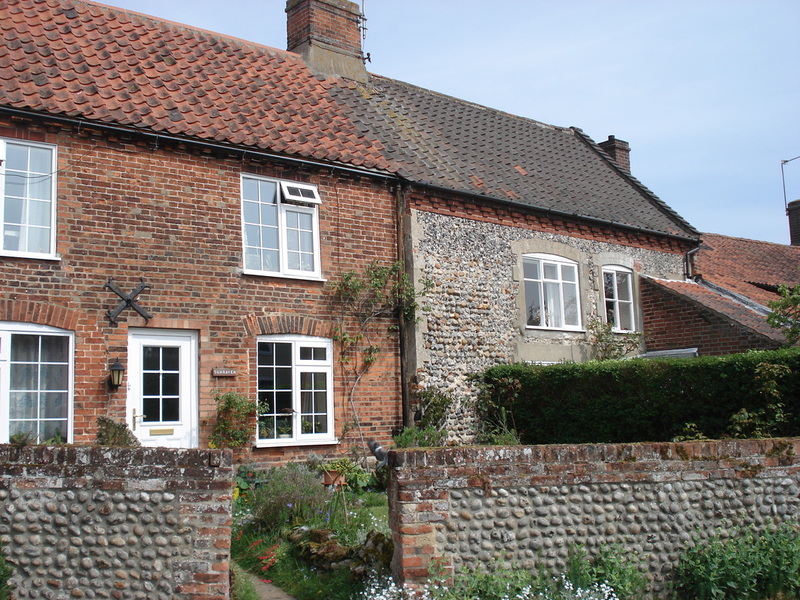 It is made of brick and flint with bay windows. In 1839 it was owned by William Primrose and William Canham was the tenant. 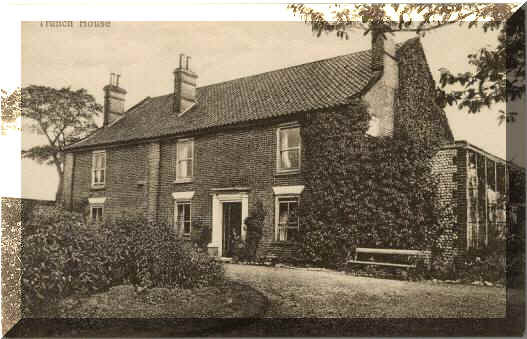 In 1841 and 1851 it was still the home of William Canham and family. He was described as a gardener and then a nurseryman. 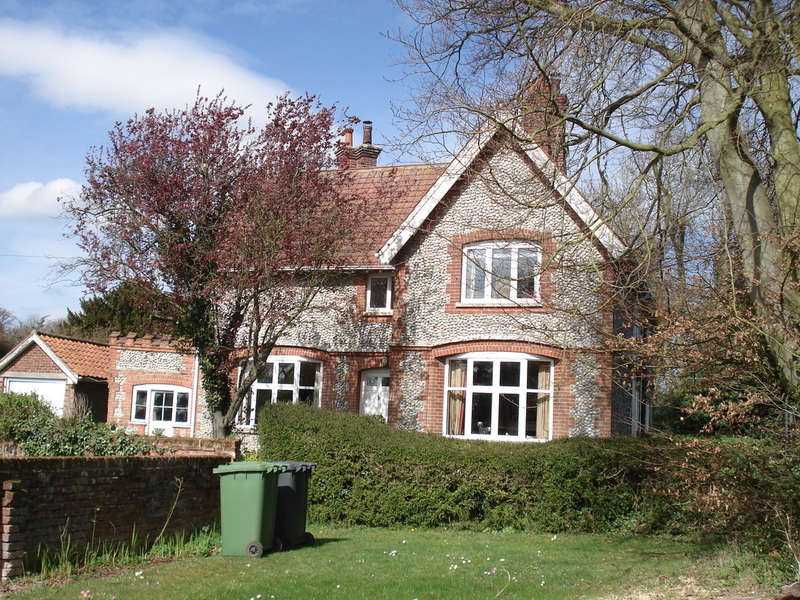 In 1861 and 1871 John Brockway a nurseryman from Leyton in Essex had moved in and then from 1881 until 1911 it was the home of Robert Wilson a nurseryman and market gardener from Sprowston near Norwich. Today it is a holiday cottage. This is a 17th. 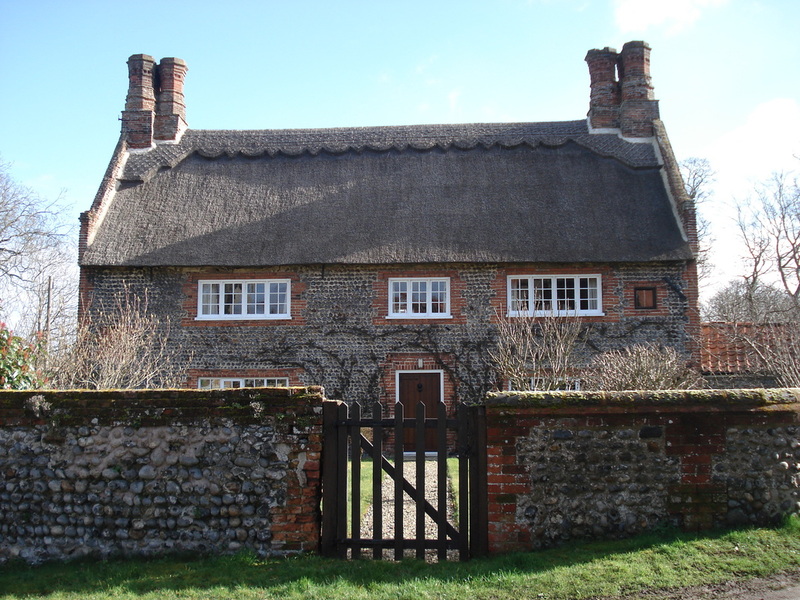 Century listed cottage of brick, flint and thatch. It has a beam with 1625 carved into it and another beam with a daisy wheel carving, thought to be for good luck. 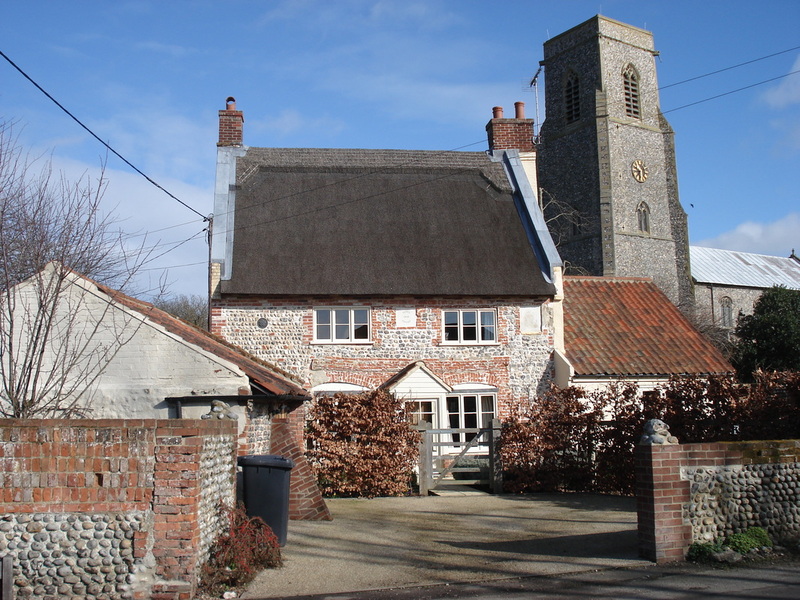 It may have been called Church cottage in 1901 and 1911 when Robert Frary and family lived there. The censuses have Mr. Frary as an oil man and then a gardener. The photo on the left may show Mrs Frary and Robert Young. In his book Arthur Amis recalls Mr. Frary selling haberdashery. He also remembered Jimmy Glister and his wife living there and running a tea room from the shed in the 1930s. Today it is a holiday cottage. 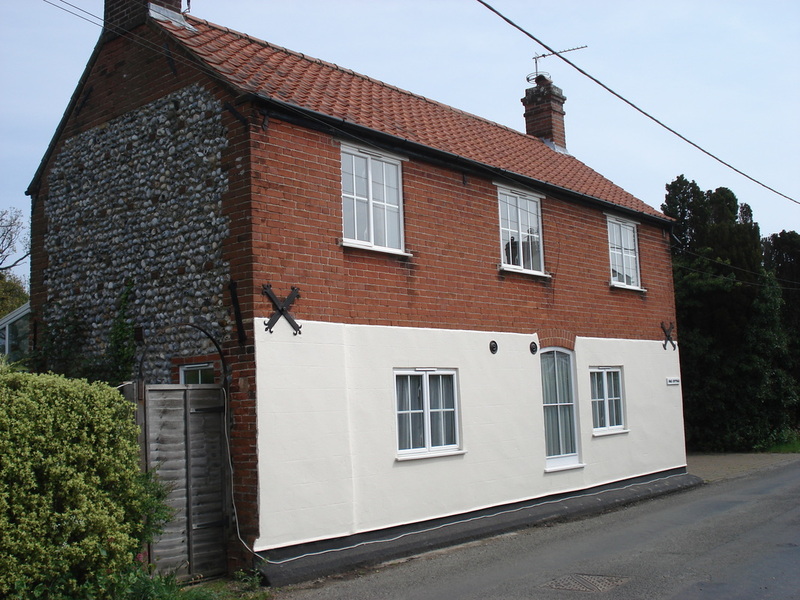 This was originally a pair of brick and flint semi-detached cottages, end on to the road, believed to have been built in the late 18th. Century or early 19th. Century. The 1839 Tithe map shows the cottages as being owned by William Canham with Joseph Ives and James Frarey living there. Residents named in the censuses were mostly agricultural labourers. 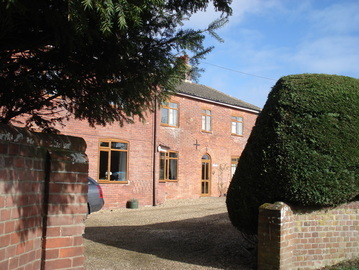 The cottages had adjoining barns for animals. In 1891 as well as Adam Fuller, a farm labourer, John Frary a vermin killer lived there and was still there in 1901. Interestingly in 1911 the road was called Frarey's Lane, even though the family had moved on. Each cottage was said to have 4 rooms and there were 6 people living in each cottage. Occupants then were farm labourers, gardeners, a servant and brewery workers. By the mid 20th. Century the cottages were derelict and were converted to one house. There were further renovations in the 1980s but one of the original open fireplaces can still be seen and there is an old well in the garden. Malthouse Square was named in the 1851 census and Stephen Colman, a brewer's labourer was living there and nearby was James Riches, a maltster. In 1871 William Frary was another maltster living there. At other times the cottages seem to have been homes for agricultural labourers. I believe the actual Malthouse was demolished at the beginning of the 20th. Century but these cottages remain. 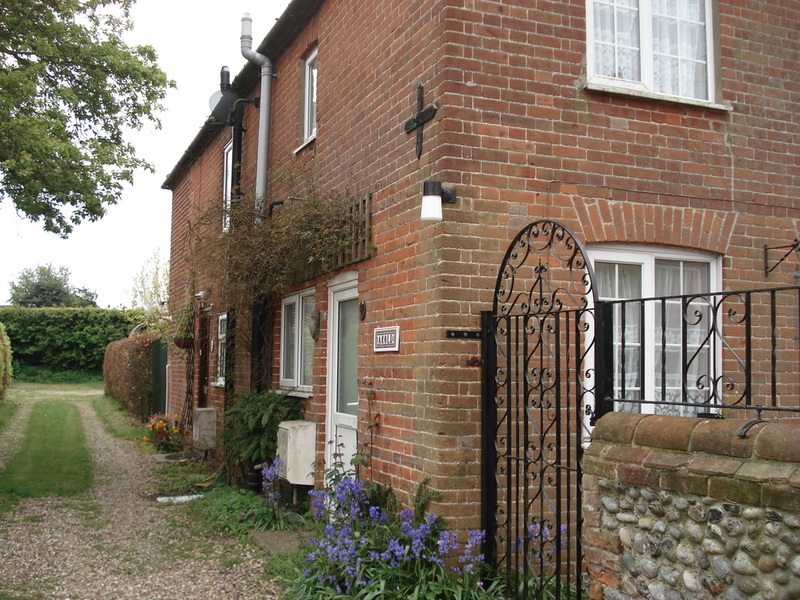 Not surprisingly the families who lived in this pair of semi-detached brick and flint cottages from 1841 to 1871 were all called Bloom and they were agricultural workers. In 1881, 1891 and 1901 Benjamin Hewitt and Alfred Fuller lived here with their families. In 1911 they were called "Cornish Cottages" after the owner and the tenants were Alfred Fuller and William Woolston, a bootmaker. 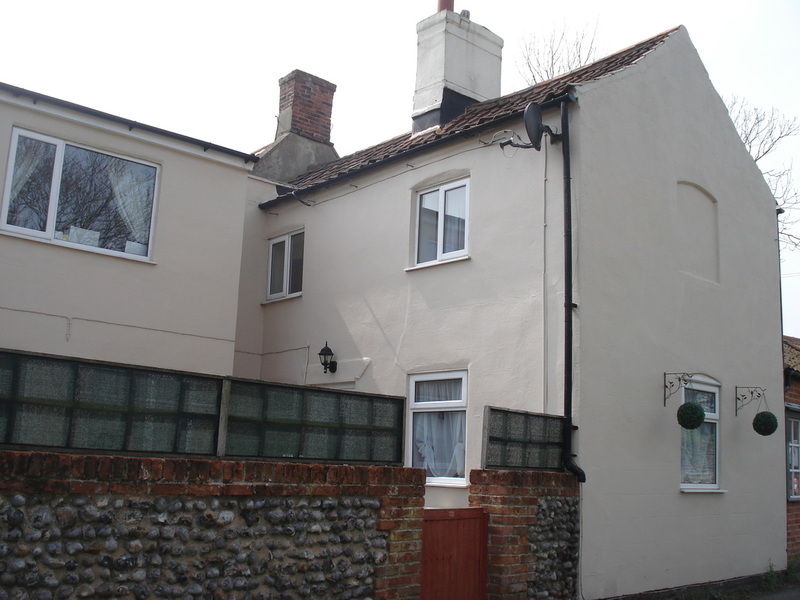 In 1932 Arthur Amies moved into one of the cottages with his wife and his neighbours were Mr. and Mrs. Norman Fuller. 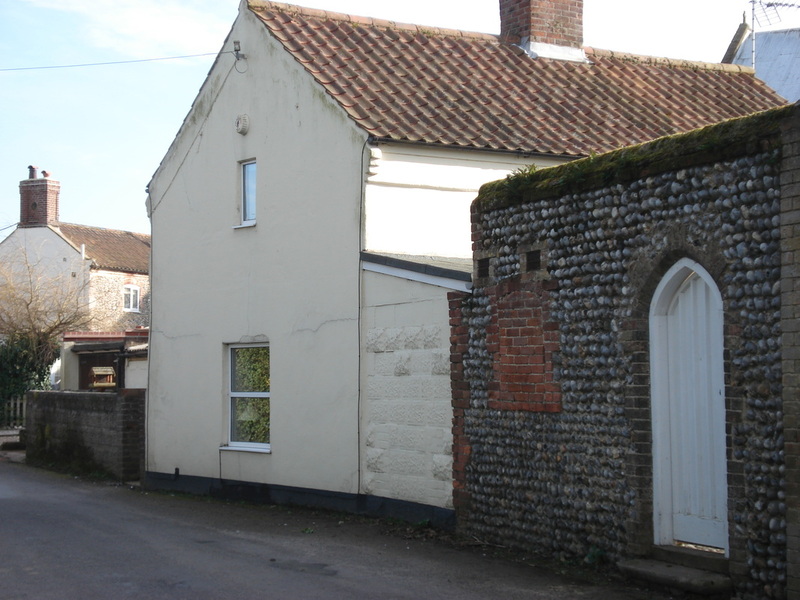 This little 4 roomed, flint cottage on the corner of Chapel Road and Wright's Loke has been the home of agricultural workers for hundreds of years. 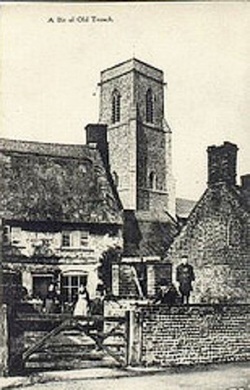 In 1839 it was owned by John Chapman and the tenants were Robert Dix and Clement Watts. In 1901 and 1911 Alfred Storey lived here with his family. He worked with horses on farms and for the brewery. This road is now called Brewery Road but it was once Warren Road from the Wright's Loke junction. It is difficult to be certain about the people living in the cottages from the censuses, because cottages were not always named (or the names changed), agricultural workers changed homes quite often, enumerators may not have entered them all in the same order and some of the old cottages have been demolished. However, taking all of this into account I have made a few suggestions. Click here for a full list of Warren/Brewery Road residents. No. 1 Warren Road - furthest from the village. 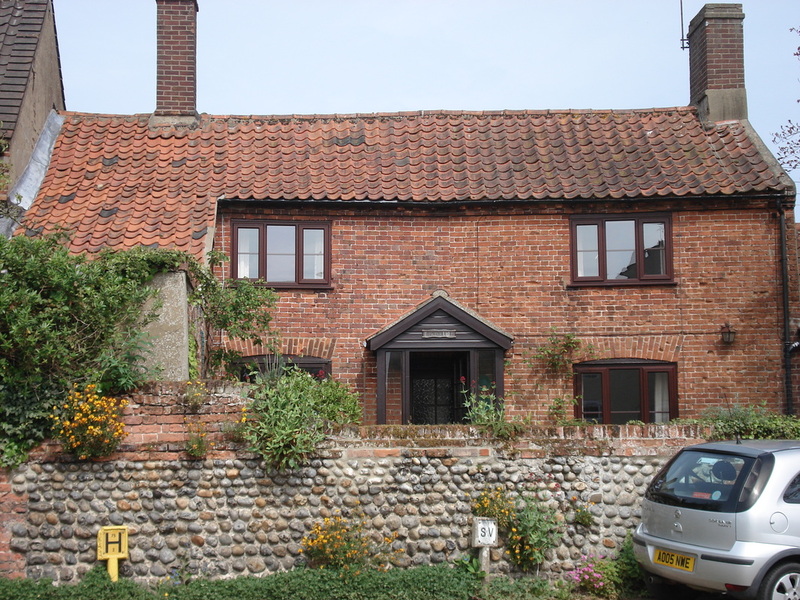 In 1841 and 1851 this small cottage (3 rooms in 1911) was occupied by agricultural worker William Willey and then by gamekeepers Thomas Boulton, Clement Sexton and John Curson. In 1901 and 1911 it was the home of George Storey, a farm worker and his family. Nos 2 & 3 Warren Road I think that these were a pair of 4 roomed cottages occupied by various agricultural workers - James Watts and Isaac Alison in 1841, Robert Dixon and Thomas Boulter in 1851. Robert Dixon was in No. 2 from 1851 until 1881, and in 1891 and 1901 Harriet Banes, a widow, lived in No. 3 with her farm worker sons. In 1901 and 1911, William Self, a bricklayer lived in No.2. No. 4 & 5 Warren Road This pair of 4 roomed cottages was occupied by various farm workers, the longest by William Frary and family from 1841-61. Apart from the agricultural workers, William Dixon, a brewery labourer, lived here in 1901 and Fred Phillips, a golf club steward in 1911. Nos. 7-12 Warren Road In 1911 these 6 cottages were named in the census. 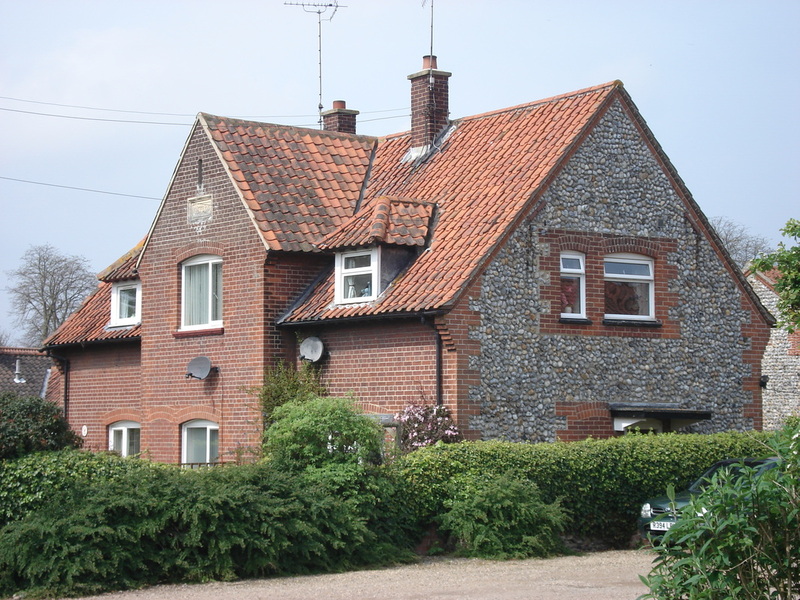 As well as being farm labourers, the residents of these cottages were often craftsmen - James Martin, a blacksmith, (1841 & 1851), Timothy and Thomas Gibbons, thatchers (1851-1871), William Gibbons, a carpenter (1861-1891), and Frank Marshall, a tile-maker in 1891. 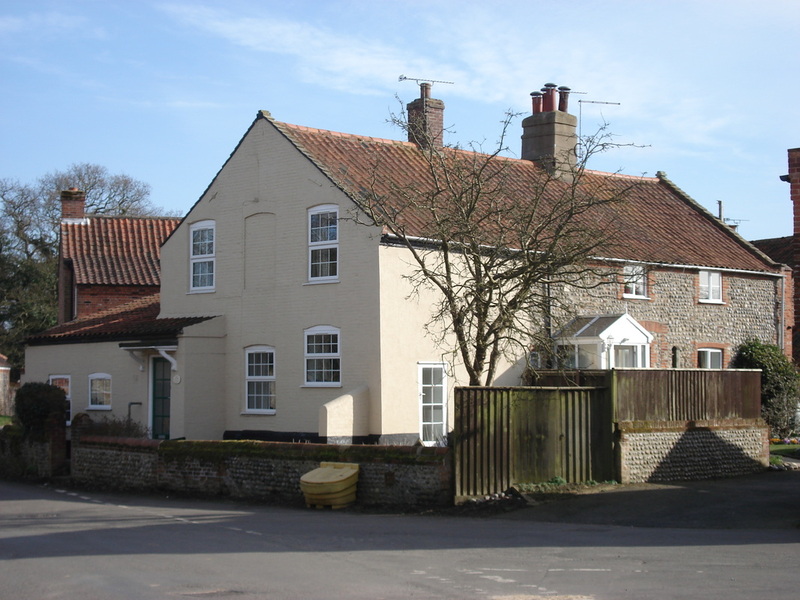 Cottages in Brewery Road (from Wright's Loke to Gimingham Road). The Tithe map shows some cottages on the North side of Brewery Road as well as a building that may be Postle's Farm. All of these houses have now gone but each census recorded 3 or 4 households in Brewery Road as well as the occupants of Brewery House. Most of the residents were agricultural workers but there were also several women as Heads of Households - Nanny Wiseman, an annuitant (1841-1861) Frances Pilch (1841 & 1851), Elizabeth Riches, widow and nurse (1861 & 1871) and Ann Fox, a dressmaker in 1901. By 1901 the Manor House had been built and Frederick Powell was in residence. In 1905 the semi-detached cottages below were built, presumably for the farm workers. The old view on the right has the New Inn (now shop) in the right foreground. The white road leading to the top of the photo is Chapel Road. Numbers 1 - 4 are there this side of the Chapel (old garage). Further up the road is Trunch House on the left and Bullen's Yard cottages on the right. 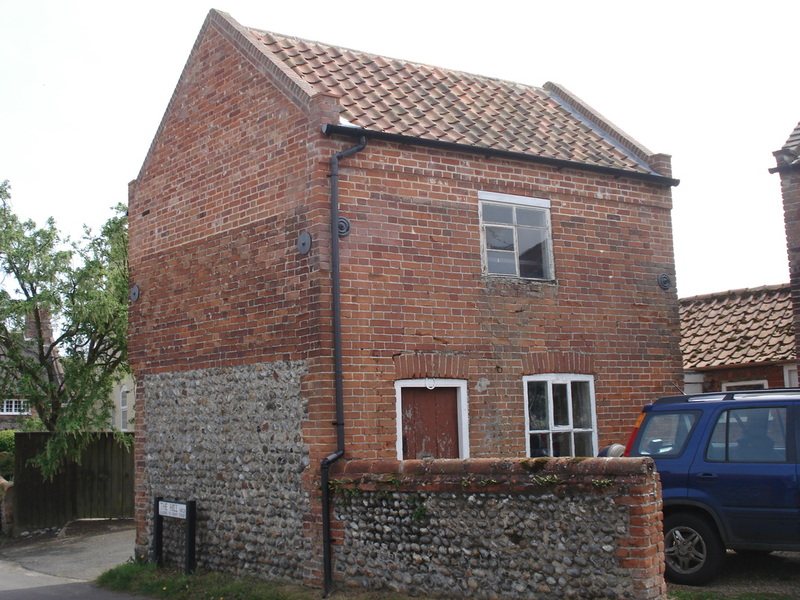 I think that the big barn on the North Walsham Road is probably the carpenter's workshop. This road was called Chapel Street until 1911. Looking at the 1839 Tithe map it is hard to see how 20 families fitted into the few buildings that are shown. From the censuses it is fairly easy to be certain of the residents of the Limes, Trunch House and the cottages at each end of the road, but the others depend upon the order in which the enumerator recorded them. From the maps it seems that the main area of cottages was near where Payne's Cottages are today, next to the Laurels and this may have been the area known as Bullen's Yard. ﻿No. 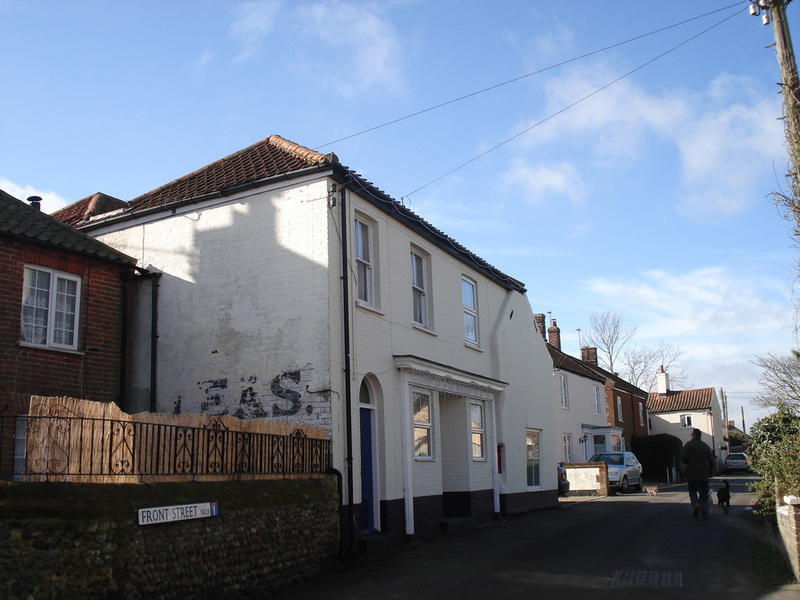 1 was occupied by blacksmiths from 1881 until 1911 and the forge was opposite on the other side of the North Walsham Road. 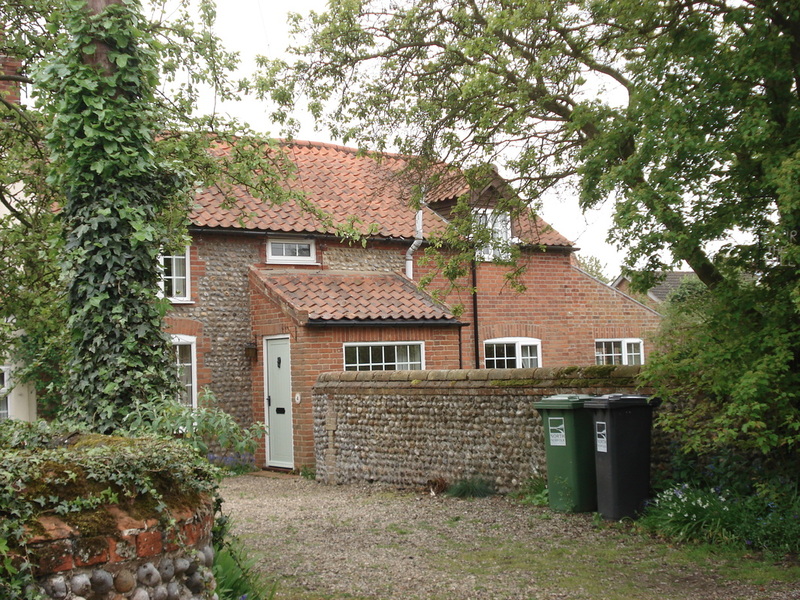 Earlier a schoolmaster, a brick maker, a milliner and a farm worker had lived here. No. 2 This pretty little cottage was the home of farm workers in all of the censuses except 1891, when William Gibbons, a carpenter lived here. Nos. 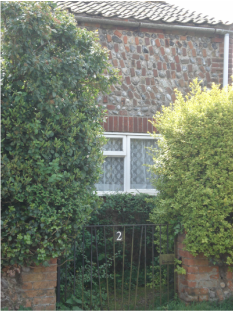 3 and 4 are a pair of semi-detached flint cottages. Each cottage had 4 rooms in 1911 but No. 3 has at times been divided into two 2-roomed dwellings. Rachel Worts, a dressmaker, lived in No. 3 in 1901 and 1911. Henry Burnett, a farm worker, was in No. 4 in 1911, while in 1901 it was the home of Deborah Gowing, a widow and tailoress. In 1891 Frederick Gowing, a maltster lived here. Nos. 5-7 In this row of cottages, built after 1880, Alfred Coleman lived in No. 5 in 1901 and 1911, Joseph Lambert lived in No. 6 in 1901 and then his widow lived there with her children in 1911. Francis Marshall, a brick and tile maker lived in No. 7 in 1901 and 1911. No. 8 North View was probably built during the late 1800s or early 1900s. In 1929 William Jackson lived in here. No. 9 The present No. 9 is this 20th. Century bungalow, so presumably the cottage that was No. 9 at the time of the 1911 census was another building. No. 10 This cottage was built after 1880. It may have been Fairfield House where Emma Dix, a lady of private means, lived in 1911. The Misses Lamb, who paid for the Cemetery Lych Gate, lived in Fairfield in 1929. 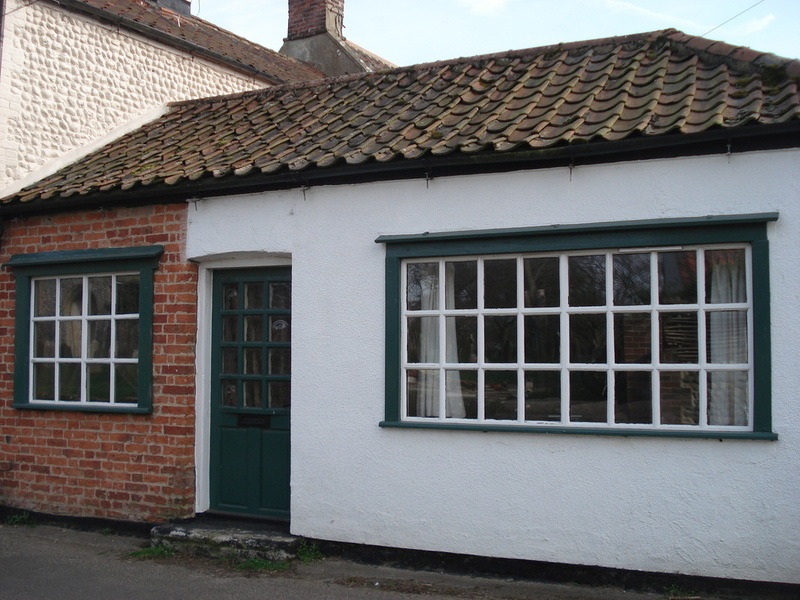 This pair of flint cottages were built between 1839 and 1880. I think that in 1911 they may have been the home of the farm workers James Fuller and Henry Fuller. Payne's Cottages From reading Arthur Amis' book I think that this was where he was living as a child in 1911. In the census of that year the cottage was labelled as number 11, so the numbers were different from today. I think No. 12 was the home of Benjamin Flaxman and family from 1861 and after he died his bedridden daughter lived there with help from a niece. This cottage next to Payne's Cottages is shown on the Tithe map of 1839 and I wonder if this area was the one called Bullen's Yard. Certainly several Bullens lived in this area:- Richard, from 1851-1881, Sam, in 1861, Mary, 1871, Jemima, 1881 and Marie in 1891. It was also an area where several shopkeepers lived as well as shoemakers and carpenters. Cottage on South side of Chapel Road This cottage, which may once have been a pair, is shown on the Tithe map as being owned by Robert Wortley and having William Watts and James Martin as tenants. It seems to have been the home of farm labourers in the censuses. There is one larger house in the 1911 census for Chapel Road, with 8 rooms, Dudley House. 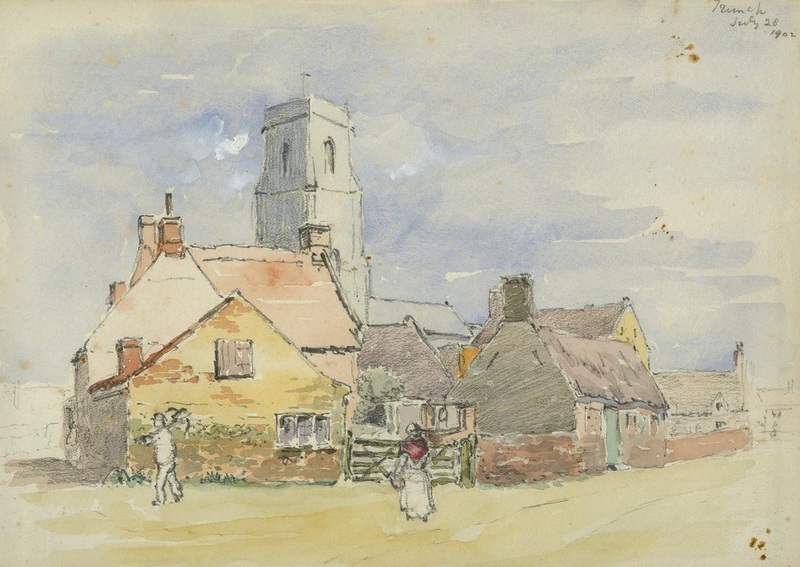 William Seago, a job master, may have lived there in 1901 and 1911. On the 1839 Tithe map it appears that Robert Wortley, a farmer, lived here. This pair of semi-detached bungalows was once a single bungalow - note the different colour of the roof tiles. Until recently a Miss Mason had lived here for many years. There used to be a dilapidated corrugated shed in the front garden and I was told that it was the workshop of her shoe-maker father. One interesting building in Chapel Road was Cosy Nook - a railway carriage where Sid Buck lived until the 1990s, when it was removed and replaced with a bungalow. Many of the cottages that were once on the Church side of Back Street have been demolished and there are now only three old cottages left. 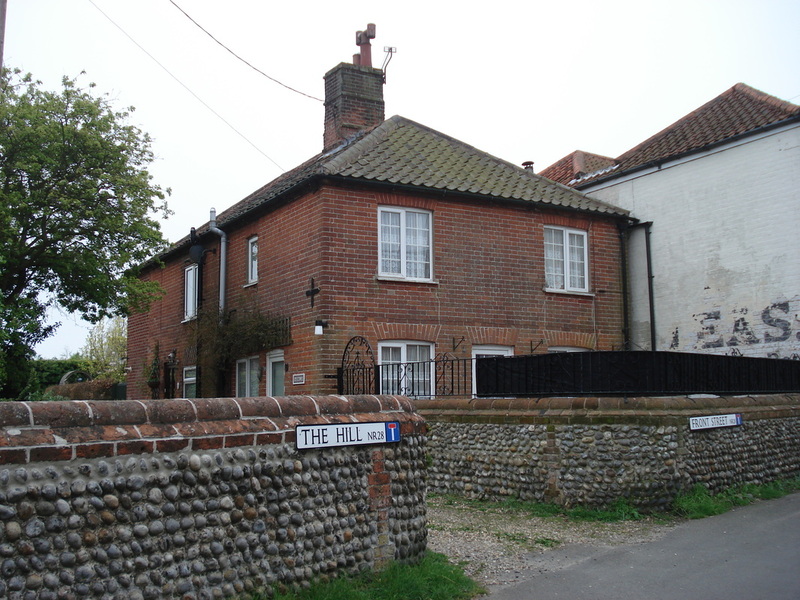 It is difficult to match residents in the census to cottages in Back Street as so few are left but it is probable that Daniel Holl, the school master, lived in School Cottage in 1851 and 1861. The most interesting resident however was Rebecca Coleman who lived in a small 3-roomed cottage in Back Street for all of her long life. In 1841 she was aged 13 and living with her widowed father and 6 siblings. In the 1851 census her father was aged 69 and she was living with him and although she had given birth to a son, Valentine, in 1846 he was not with them. However by 1861, her father had died and she was Head of the Household and Valentine was living with her along with 4 other children. In all she had 9 children between 1846 and 1865 but no father was ever named on the birth or baptism records and she was stated to be single in all of the census returns except 1901, when it says "widow". Rebecca supported her children by being a charwoman and washerwoman and when her sons were old enough they worked on the land. It must have been a hard life and one of her grandchildren was born in the Workhouse. In 1911 she was an 83 year old age pensioner, still living in Back Street. Most of the old cottages on the Hill still seem to be there but because of the way that they are grouped it is difficult to match some of them to census residents. 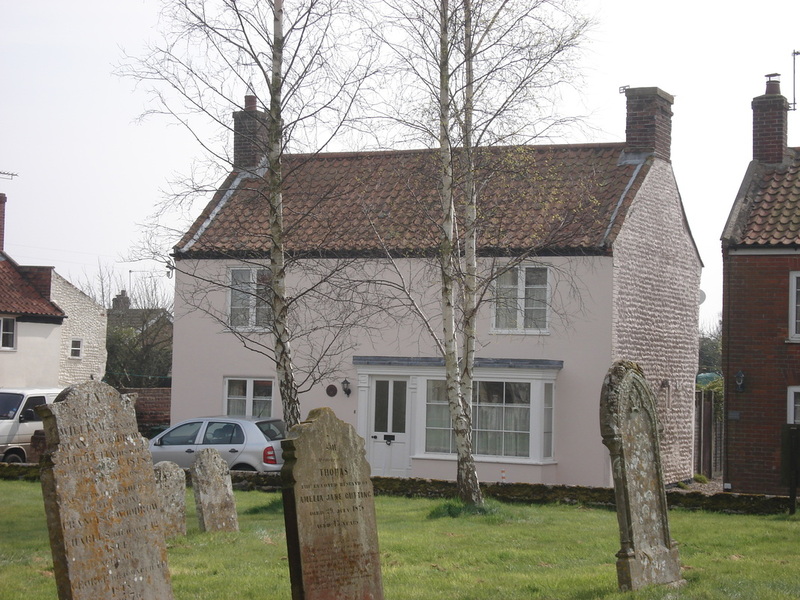 However in 1911 three cottages were named as "near the pump" and so I think they were the ones below, inhabited by Arthur Fuller, a farmer, William Gall, a horseman and Frederick Reynolds, a farm labourer. One of the families who lived on the Hill were the Bullens and at times one of the areas was called "Bullen's Yard". William who was a carpenter and wheelwright lived there in 1861 and 1871 with his wife Hannah. After his death his son Alfred took over the business and his widow Hannah did some farming. In 1901 Alfred described himself as a carpenter and well-sinker and in 1911 his son Herbert was an assistant well-sinker. (There were more Bullens living in Chapel Street, another branch of the same family I think - see above). In the 1930s the residents of the cottages above were Edward Paul and Ellen Temple. The cottages were all refurbished in 2015. Amies Yard One area of the Hill near to the Post Office was called "Amies Yard" probably after William Amies who lived there in 1841 and 1851. 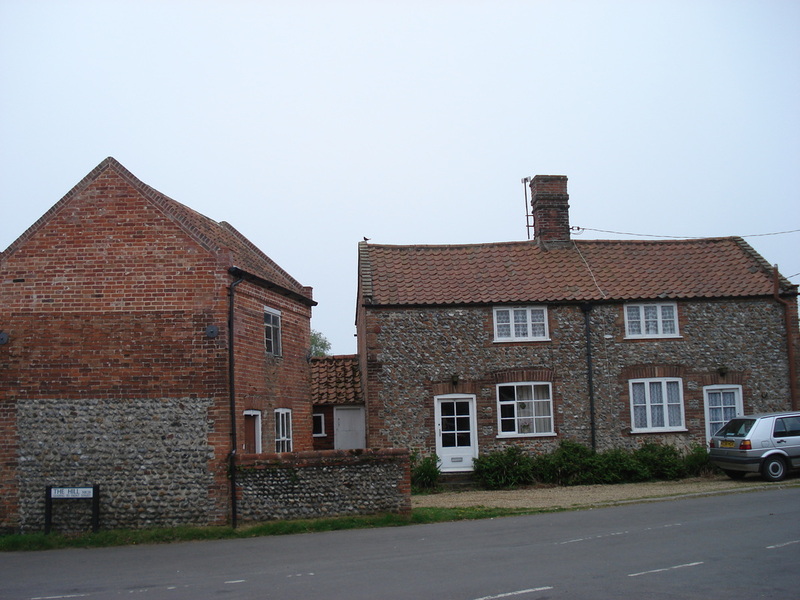 The cottages were mostly occupied by farm workers but Isaac Riches, a maltster, farm worker and groom lived here from 1861 until 1881. Cottages on the Hill - Amies' Yard? Cottages next to the Post Office The cottages above and below, were referred to in some of the censuses as those next to the Post Office, in Church Street, rather than on the Hill. 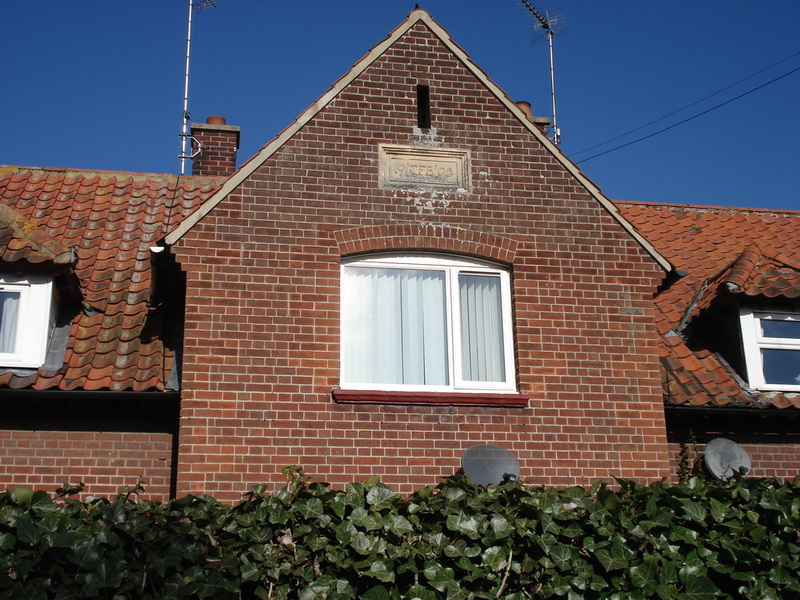 One of the cottages seems to have been the home of the village Police Constables in 1861, 1881 and 1891 and in 1901 and 1911 Edward Wegg, a brickmaker, lived here. Residents of the old Post Office are listed on the shops page. Click here for Trunch shops The cottage to the West of the Post Office was probably once two dwellings and it seems likely that in 1841 William Sussins, a shoemaker lived in one of the cottages. In 1861 William Buttle, a brickmaker may have lived here and in 1871 and 1881 John Pitt, an agricultural labourer seems to have been a tenant. Samuel Norman, a saddler probably lived here in 1901 and 1911. In the 1930's it was Pike's grocers and drapers. 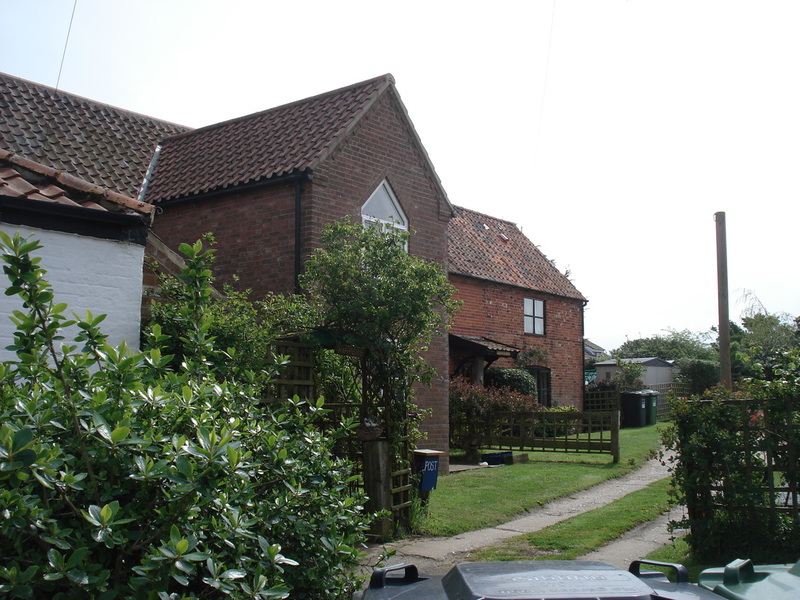 It is difficult to be certain who lived in the pair of semi-detached cottages above from the censuses but quite often they appear to have been the homes of agricultural labourers. The cottage, shop and yard above belonged to the shopkeepers - James Watts from 1841-1861 and Josiah Fuller 1871 -1901 and his son Arthur in 1911. 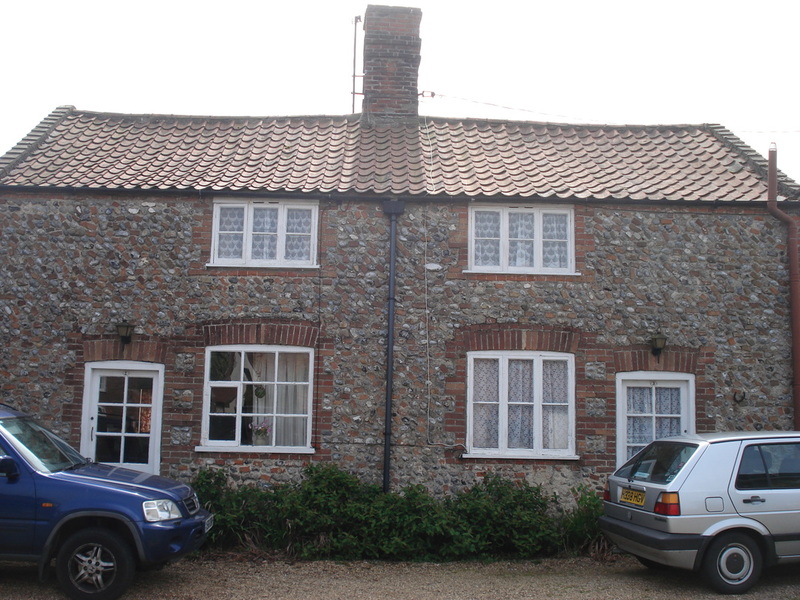 The cottages in the yard were occupied mainly by relatives and agricultural labourers. Until fairly recently the cottages in the yard were completely hidden by vegetation before they were renovated. Other residents of Church Street There were at least 2 cottages on the Church side of the street. 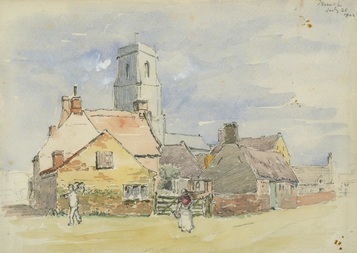 Tudor or Thatched Cottage on the corner which is described above, and there was another cottage next to it, which can be seen in the old sketch, but has now gone. Somewhere however there had to be accommodation for quite a few more people including William Benns, a shoemaker from 1841-1861 and Weggs, the butchers, from 1881 - 1911. Hopefully more research will enable me to match more residents to their homes.